http://www.hankookilbo.com/News/Npath/201901271489727554 URL을 길게 누르면 복사할 수 있습니다. 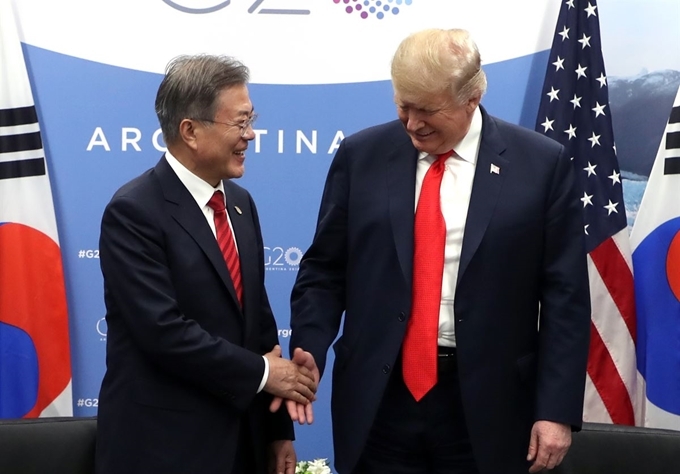 It is irrational for the United States to ask South Korea to pay an annual $1.2 billion (1.35 trillion won) for the upkeep of American troops stationed here this year. This sum is about 40 percent more than the 960.2 billion won ($851 million) paid last year. According to government sources, Washington has set the bottom line at $1 billion after the two sides failed to agree on how much more Korea should shoulder during their 10th round of talks held in Seoul last month. 미국이 올해 주한미군의 유지를 위해 한국에 12억불(1조 3,500억원)을 부담하라고 요구하는 것은 불합리하다. 이 금액은 지난해 분담금 9,602억원(8억 5,100불) 보다 40퍼센트나 더 높다. 정부 소식통에 따르면, 지난달 서울에서 열린 10차 협상에서 분담금 인상 합의에 이르지 못한 후 최저치를 10억불로 못박았다. More worrisome is that the Trump administration has continued to apply stronger pressure on the government to pay more for the presence of the 28,500-strong U.S. Forces Korea (USFK). Amid the stalled cost-sharing talks, U.S. Ambassador to Korea Harry Harris visited Cheong Wa Dae in December to discuss the issue with Chung Eui-yong, chief of the National Security Office (NSO). 더 우려되는 것은 트럼프 행정부가 28,500명의 주한미군 주둔 비용을 더 많이 부담하라고 한국 정부에 더 강한 압박을 계속 가하고 있다는 것이다. 방위비 분담 협상이 교착 상태에 빠지자, 해리 해리스 주한 미국대사는 정의용 국가안보실장과 이 문제를 논의하기 위해 지난 12월 청와대를 방문했다. Harris notified Chung of the U.S. demand for the steep increase, urging Seoul to pay $1.2 billion for the stationing of the American troops. He also reportedly told him the minimum amount would be $1 billion. But Chung turned down the request, making clear that the government cannot pay more than 1 trillion won ($886 million). Local media reported that the U.S. envoy described the offer as a final one, meaning he gave an ultimatum to the Korean side. 해리스 대사는 정 실장에게 미국의 급격한 인상 요구를 통보하고 미군 주둔 비용으로 12억불을 지불하라고 촉구했다. 보도에 따르면 그는 또 정 실장에게 최저 금액은 10억불이라고 이야기했다. 그러나 정 실장은 이런 요구를 거부하고, 한국 정부는 1조원(8억 8,600만불)이상은 부담할 수 없다는 점을 분명히 했다. 국내 언론은 미국 대사가 이 제안이 최종적이라고 했다고 보도했는데, 이는 그가 한국측에 최후 통첩을 한 것을 의미한다. The demand came suddenly. During the previous rounds of the Special Measures Agreement (SMA) talks, the U.S. side had not put forth such a steep increase. Sources said the sudden move reflected the orders of the top U.S. leadership. In other words, President Donald Trump has virtually instructed his negotiators to get Seoul to shoulder a far greater share of the defense costs. It is not strange for Trump to make such a demand, given that he has often described South Korea unfairly as a “free rider” in the bilateral defense alliance. 이런 요구는 갑작스럽게 나왔다. 이전의 한미 방위비분담 특별 협정(SMA) 협상에서 미국측은 이렇게 급격한 인상을 요구하지 않았다. 소식통은 이런 갑작스런 요구는 미국의 최상부의 지시를 반영한 것이라고 말했다. 다시 말하면, 사실상 도널드 트럼프 대통령이 한국 정부가 방위비를 훨씬 더 많이 부담하라고 지시했다. 트럼프 대통령이 종종 한국을 방위 동맹의 ‘무임 승차국’이라고 부당하게 묘사한 점을 고려할 때, 그가 이런 요구를 하는 것은 이상한 것이 아니다. The fact is that South Korea currently pays 42 percent of the total costs for the maintenance of the USFK. If the free use of land for U.S. bases here is included, Korea’s share increases to as high as 80 percent. Besides, the Seoul government spent $13 billion on the expansion of Pyeongtaek’s Camp Humphreys, the largest overseas U.S. military base, for the relocation of American troops stationed in Seoul and border areas. 사실은 한국이 현재 주한미군 전체 주둔 비용의 42퍼센트를 부담하고 있다. 미군기지 부지의 무상 사용을 포함하면 한국의 부담은 최대 80퍼센트까지 올라간다. 뿐만 아니라, 한국정부는 서울과 전방 지역에 주둔한 미군의 재배치를 위해, 해외 최대의 미군 기지인 평택 캠프 험프리스의 확장에 130억불을 지출했다. Taken overall, the U.S. demand is too excessive. More serious is that the Trump administration is trying to use the South Korea-U.S. Mutual Defense Treaty as leverage to force its ally to shoulder well over half the total costs. This arrogant U.S. attitude was evident in Harris’ reported remarks to Chung. The ambassador, who once served as the commander of the U.S. Pacific Command, said Washington may consider implementing the treaty in a different way. 전반적으로 볼 때, 미국의 요구는 지나치게 과도하다. 더 심각한 것은 트럼프 행정부가 동맹국인 한국이 전체 주둔 비용의 절반 이상을 부담하도록 강요하기 위해 한미상호방위조약을 지렛대로 사용하고 있다는 것이다. 이런 오만한 미국의 태도는 정 실장에게 한 해리스 대사의 발언에 명백하게 나타나고 있다. 한때 미 태평양 사령부 사령관으로 재직했던 해리스 대사는 미국이 한미상호방위조약을 다른 방식으로 이행할 것을 고려하고 있다고 말했다. We have to question what Harris really meant. His words might sound like blackmail or a threat to scrap the mutual defense pact unless Seoul accepts the U.S. demand. They also seem to go way far beyond Trump’s “America first” policy. We urge Washington to drop its undue demand and see the value in the traditional alliance, instead of putting a heavier burden on Seoul. 우리는 해리스 대사의 진위가 무엇인지 의심하지 않을 수 없다. 그의 발언은, 한국이 미국의 요구를 받아들이지 않는다면 상호방위조약을 파기하겠다고 협박 또는 위협하는 것처럼 들릴 수도 있다. 이는 또한 트럼프 대통령의 ‘미국 우선주의’ 정책을 훨씬 더 넘어서는 것처럼 보인다. 우리는 미국이 과도한 요구를 포기하고, 한국에 부담을 가중시키는 대신에, 전통적인 한미동맹의 가치를 인식하기를 촉구한다.